As recycling has been a big issue within London. People are becoming more confident in recycling which is usually left outside their homes. However there seems to be an increase where neighbours have made good use of things that people leave out for recycling. The question “what’s the best thing you’ve ever liberated from your neighbours” has opened a door into a strange world of ‘light-fingered’ recycling and threats of legal action. For example people are grabbing lawnmowers, record collections, goldfish bowls and even furniture. 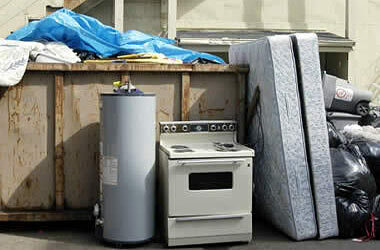 However, even if your neighbour takes the unwanted things that you do not want, there is always items that will be left. We at EC waste services can collect all the unwanted junk that is left over, things such as old lawnmowers. People are in fact actually making good use of the things that other people do not want and more and more people are keeping a look out for their neighbour’s rubbish. But, is prodding through bins even legal? Answer to that question is, yes if a neighbour gives consent to taking the recycled items left outside their house. However, if the neighbour says no then the person who takes the item will be in real danger of falling foul of the law. Coming back to the question “what’s the best thing you’ve ever liberated from your neighbours”, which has been ask to hundreds of residents has revealed that half were prepared to admit that they have taken something from their neighbours, about two thirds of those people asked their neighbours permission before taking it whereas the rest had not asked for permission. If you do not wish to let your neighbours take your recycling junk then we at EC waste services are happy to collect them, you simply need to arrange an appointment and date to pick up the waste from your door step.